I appreciated receiving an email from you today thanking me for choosing Hampton Inn & Suites in Bethlehem and letting me know that you want to make all my stays as comfortable and rewarding as possible. I received a message like yours back in March 2011 from the Hilton Garden Inn/Chelsea, in Manhattan. I responded with a letter similar to this one and am disappointed that more than 5 months later, no changes have been made. The room was quite comfortable and the service was accommodating and friendly. What I was not comfortable with was the complimentary breakfast. I appreciate being offered complimentary breakfast with my stay along with hot beverages any time of the day. I understand that you are operating a business and want to attract and keep customers, and be profitable. Offering free food is attractive to many. Yet, as a ‘forward thinking global leader of hospitality’ and being ‘the first hotel in the world to earn both LEED and Green Seal environmental certifications’ I am confused by the fact that Hilton serves food that is unhealthy to people and damaging to the environment. Let me explain. Your jellies, syrups and peanut butter from Smuckers contain high fructose corn syrup. This is an extremely unhealthy product and should not be consumed. Hilton should find a supplier that does not use high fructose corn syrup as a sweetener and should encourage Smuckers to remove high fructose corn syrup from their products. Production of high fructose corn syrup is also not environmentally-friendly. Hilton offers only cow’s milk. Most people of Asian and African descent are lactose-intolerant. Many abstain from consuming cow’s milk for religious or ethical reasons. Milk has been shown in hundreds of medical studies to be linked to breast and prostate cancer. The American Dietetic Association has acknowledged that cow’s milk is not required for a healthy diet. The production of milk is also devastating on the environment and a major cause of global warming. There should be milk alternatives for your customers and I don’t mean non-dairy creamers. Non-dairy creamers, like the ones served at the Hampton Inn, are very unhealthy products, containing artificial colors, hydrogenated oil and corn syrup. Non-dairy milks – like soy, rice or almond milk should be served. These come in bottles or plastic containers that do not have to be refrigerated until opened. They can easily be on hand indefinitely until a customer requests non-dairy milk. There are also soy and coconut milk-based yogurts available. There were numerous bread products available, all made from unhealthy refined wheat flour. Many people have wheat and gluten allergies. Celiac’s disease is affecting more and more people. Yet all of the breads available during my stay were wheat-based. I recommend including gluten-free bread products or at the very least include rice cakes alongside the wheat breads. Oatmeal is an excellent food, but the Quaker Oats individual packages contain unnecessary, unhealthy ingredients. Oatmeal should contain only oatmeal and nothing else. Plain oatmeal should be served with items, such as unsulphured dried fruits and other whole food toppings, which people can choose to add on the side. If Hilton really is the ‘forward thinking global leader of hospitality’ all the food offered should be organic. Pesticides and herbicides are damaging our farm lands and expose farm workers, their families and neighbors to cancer-causing chemicals. I do not wish to consume foods with residual toxic pesticides and herbicides that can accumulate in my body. Hilton Hotels should not serve meat and egg products that come from animals raised in the filthy, crammed, cruel conditions of today’s factory farms. Serving these foods tacitly implies that Hilton supports the environmental destruction this industry causes along with the pain and suffering it inflicts on billions of innocent animals every year. In today’s economy, to cut costs, businesses often serve low-quality products even though they are unhealthy and environmentally destructive. As the ‘forward thinking global leader of hospitality’ Hilton has the opportunity and the responsibility to lead the way, showing everyone that providing quality, health-promoting, planet-friendly, delicious food is good for business, good for people, good for the environment and the only sustainable choice for our future. First, thank you for your comments, I appreciate hearing from people. Second, let me address the points you brought up. I believe people and companies should strive for the best – the best quality products, that are healthy, environmentally-friendly and sustainable, without exploiting people or non-human animals in the process. Boiled eggs are not healthy! They are loaded with cholesterol. There are numerous studies in the medical literature today which discuss how unhealthy eggs are. And unless you know the chickens that laid the eggs, the odds are they lived in filthy, horrible, cruel conditions. The “plain” oatmeal is not plain! It contains calcium carbonate, salt, guar gum and a bunch of added vitamins that I don’t want to consume – the latest nutrition studies show that Vitamin A and Folic acid are dangerous and should not be consumed. Instead we should be getting folate and carotenoids from whole plant foods. When I eat oatmeal it’s made with plain rolled oats, water and fresh or dried fruits, raw nuts and seeds and nothing else! I enjoy tea with my breakfast but when the water has not been filtered, not only does it taste awful but I am consuming chlorine, fluoride and many organic chemicals that are unhealthy. At home I distill my water. I would appreciate, at the very least that restaurants and hotels would have some sort of water filtration system. “Not everyone cares or wants to eat what you want.” Interesting comment. Most hotels including the Hilton boast about satisfying the individual. Unfortunately many people are brainwashed by slick advertising to want to consume foods that are not good for them. As a result heart disease and type 2 diabetes (both preventable and reversible) are plaguing more and more people today. If they were more educated about food, AND if restaurants and hotels made an effort to make healthy food accessible and delicious, people would be healthier, feel a lot better and health care costs would go down. Who doesn’t want these things? Dairy is not healthy and it linked to numerous health problems including breast, prostate and ovarian cancers. Many people are lactose intolerant. How difficult is it to have nondairy milk (soy, almond, rice) on hand for those that would enjoy it? The raising of dairy cows is cruel, inhumane and devastating on the environment. Am I being snooty for wanting a clean environment for future generations? Am I being snooty for not wanting to support products that cause pain and suffering to animals or serious health problems for people? Now how about coffee? There is a lot of information on coffee in the medical literature and the results are mixed. It’s sometimes good for you and sometimes it’s not. At the very least, the people who grow the coffee for you should receive a livable wage and be able to feed their children and send them to school which is only guaranteed when it’s fair trade certified. If you are drinking coffee it should be fair trade and organic. This is not the coffee I see at chain hotel breakfasts. Then there is the issue of organic food. Keep in mind that industrially grown foods including the oatmeal and fresh fruits served contain residual amounts of toxic pesticides and herbicides. Not only do I want to consume these chemicals, I don’t want individuals who are working on farms to be exposed to them. They have been shown to increase cancer rates in the farm workers as well as increasing birth defects in their children. What is snooty about not wanting this to happen to these innocent people? Lastly, breakfast that is included with a hotel room is not free. Its costs are factored into the price of the room. I do not want to pay for things that exploit people and animals, pollute the planet or are dangerous to consume. I encourage all food service establishments to consider the issues I bring up and see if there is way to provide the consumer with quality food products for a reasonable cost that are gentle on the planet, cruelty-free and health-promoting. That’s Responsible Eating And Living. Hey! Healthy clean food is not snobish! Im a health guru too! You are what you eat! We dont need regular eggs wuth growth hormones & antibiotics! Hilton can clean up their food choices along with organic yogurt ,wheat free & gluten free products! 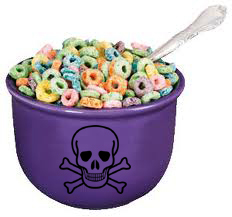 Organic cereal would be nice instead of fruit loops. Unsweetened Almond & coconut milk are much needed. SOY is deadly. Mimics estrogen. All the hotels should serve at leas one healthy vegan option, at least one kind of vegetable milk and at least something more than fruit. For people like me that is continously traveling, is horroble to find just frozen fruit and canned juices for breakfast. Good that you are asking for privileged food options. Question is, are you ready to pay extra for those options? Many times Hotels do not have options for better quality food simply because it is not affordable. I work in Hospitality industry therefore I have seen people who take advantage of free food and waste it or literary take it home with an attitude of “I paid for it” (unfortunately in our area they waste lot more since we are in tourist area). You do see better options where you have paid breakfast for simple reason that they have lower food cost and they make money or at least recover cost. Everyone loves best of the best and everyone loves it more when it is free, but let us be realistic about it. I would love to propose my boss better options for breakfast (we have free breakfast) if people are ready to pay minimum $90 for one night stay. But alas they want free breakfast with lots of options for $50 which is impossible for hotels owners to offer. It is nice to only look at any issue only from one side but one should look at things from both sides’ point of view. I would rather the hotel offer nothing than food that is unhealthy and bad for the environment. It is time to stand up for quality food everywhere, in schools, hospitals and hotels. Unfortunately the unhealthy foods often are cheaper than the healthier options because of poor government decisions and powerful corporate lobbies promoting sugary, refined processed foods. Yes, I would rather pay MORE for limited healthy, organic, minimally processed plant foods, rather than a buffet of all-you-can-eat crap. It should not be a privilege for people in the United States to have affordable healthy, organic food. Junk food should not be cheap and affordable and abundant. This leads to chronic disease and poor quality of life and high health care costs. When we choose cheap, unhealthy foods, we pay in the long term.